I like to think of myself as a summer girl, but this year I’m strangely really looking forward to autumn, the month of layering, cosy jumpers and hot chocolates in front of the fire. It’s also the first season of Autumn I offically have a reason to fill up my wardrobe with new clothes seeing as I’m no longer wearing uniform. Tartan is definitely my favourite trend for A/W, and I’m desperately after a nice tartan scarf to chuck on top of all outfits. 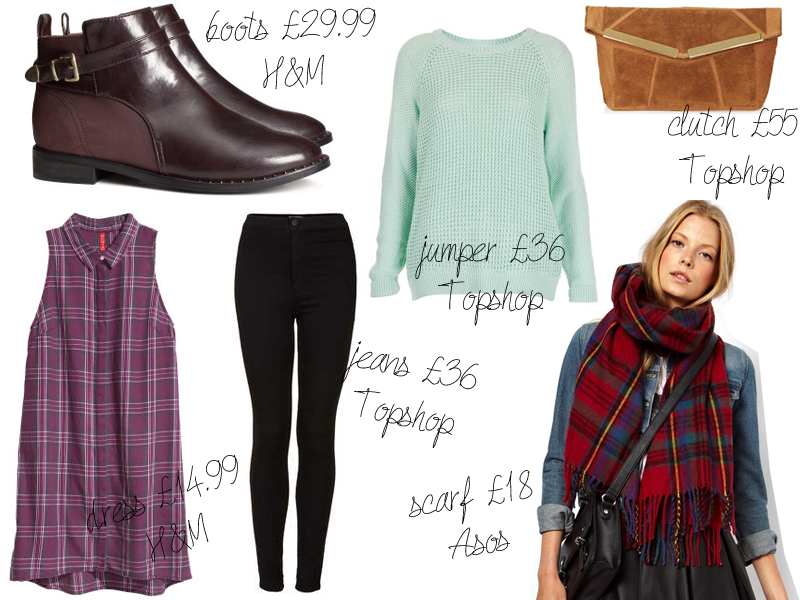 I loved this checked shirt dress, I can imagin it being a perfect grungy outfit paired with tights and some docs! I’ve actually ordered the boots, I saw them a while back and fell in love, not only with the boots but with the price and I was devastated when they went off the website, so obviously the minute I saw them back online I grabbed them while I could. The jeans are a necessity – I’m pretty sure all winter I will be living in my new favourite Joni Jeans, so I definitely need a black pair so people don’t start thinking I don’t wash my clothes..